This is Lifetime Quilt Number 154 but only my second baby quilt! I made my first baby quilt ages ago, it was LQ# 48! I'm going through that phase where my friends aren't having babies but neither are their babies. Have you ever noticed that, you go through wedding phases, your wedding and your friends weddings, then it's your babies and your friends babies, then your friends babies start getting married? Well I hope I'm entering the babies baby stage because I sure enjoyed making this quilt. I needed a pattern for a baby boy, I had no problem finding baby girl colors and patterns that I liked, baby boy options were mainly sailboats and trucks. Then I stumbled upon this Hazel Hedgehog pattern by Elizabeth Hartman. Even though the hedgehog is named Hazel, I thought it would work for a baby boy quilt. 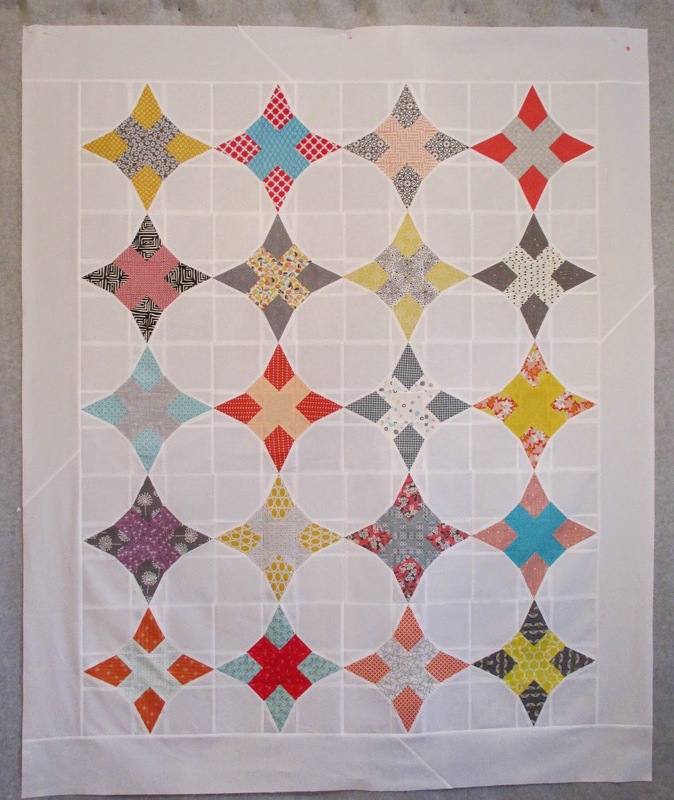 To make this quilt I used both of the Hazel Hedgehog patterns, I and II. They are available here. I've named it Prickle, because that is what a pack of hedgehogs is called! It finished at 36 1/2" x 36 1/2"
It has approximately 188 pieces. This is the fabric I'm using for the back! It's by Kate and Birdie for Moda. I've already started my next project, a flowering snowball quilt that I'm completely copying from Nicole, pictures and details to come. But here's Nicole's, I expect mine to look pretty similar! First - if you've not seen Messy Jessy's Snapshots tea kettle block take a minute and to check it out, it's very original and adorable. The link is in my Favorite Blogs list. the pattern by Xen Chic. I made this top for my favorite daughter's new apartment. She plans on hanging it on the wall between her dining area and her living area. That space is only 61 inches wide so I needed to change the size of the pattern a bit to fit. It finished at 58" x 70"
It has approximately 584 pieces. 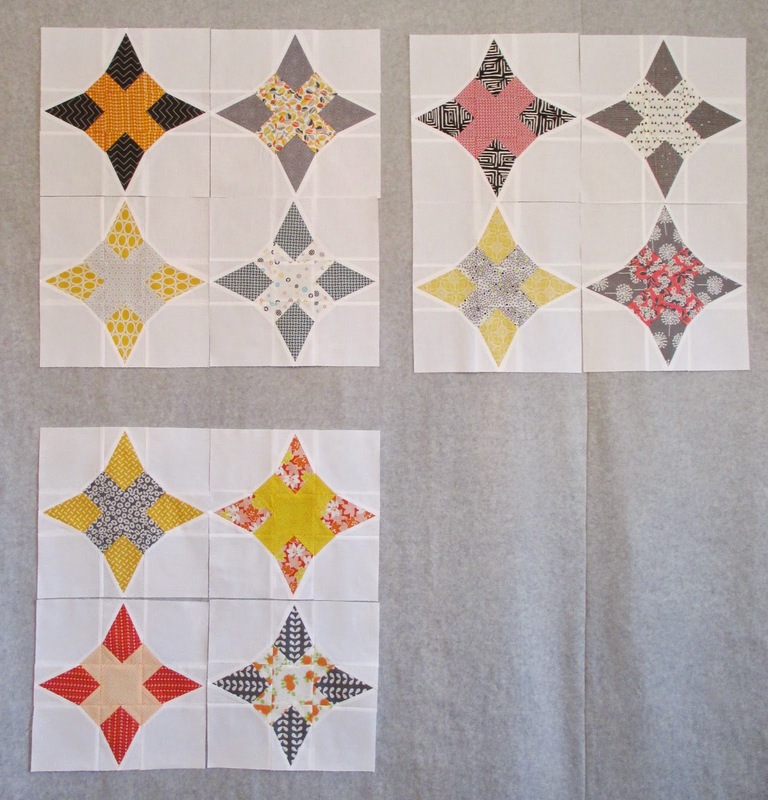 I still struggle with choosing the right combinations of fabric and here are 4 blocks that didn't make it into the quilt; top left, center pieces sort of melt into outer pieces, top right, I didn't care for the dark black center, bottom left, this was the first block I pieced, and I loved it, but when it was mixed in with the other blocks it was too bold, my eyes were always drawn right to that block, and finally, bottom right, I thought the center fabric did't have enough color. I've been getting some spring cleaning and organizing done the last couple of weeks, which feels great but has cut into my sewing time. Next up, a baby quit, out of the 152 quilts I've finished, only one was for a baby, I'm eager to make my second one. I can't believe it's the 15th of the month already. My March got off to a rough start weather wise but things are improving and flowers are even starting to sprout out of the wet cold ground. Additionally, I'm finally starting to adjust to the time change. 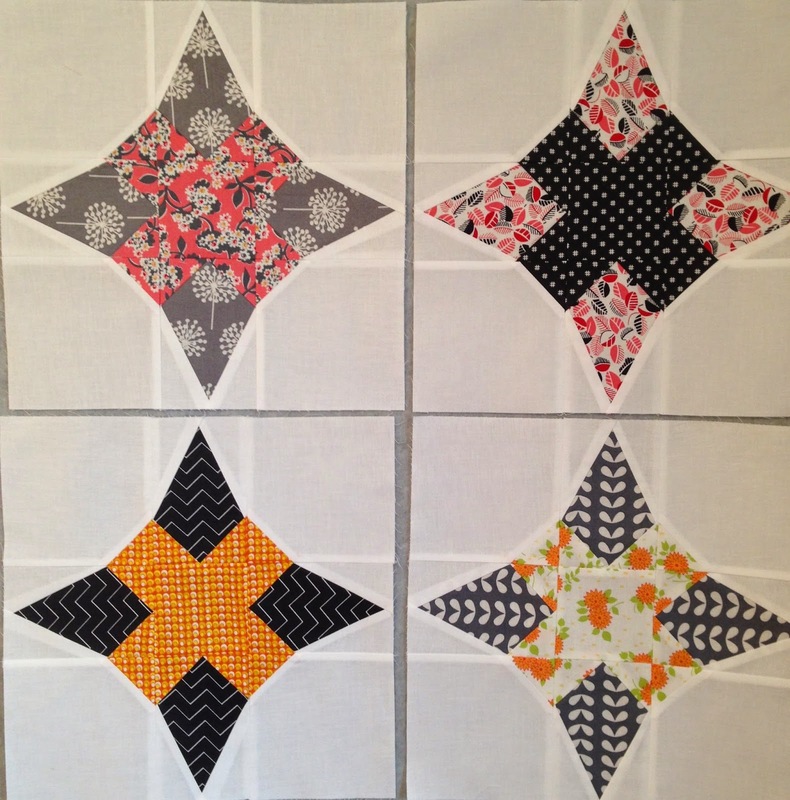 So besides all that March activity a new month also means it's time for a new Fat Quarter Shop Snapshots pattern! WOO HOO!! 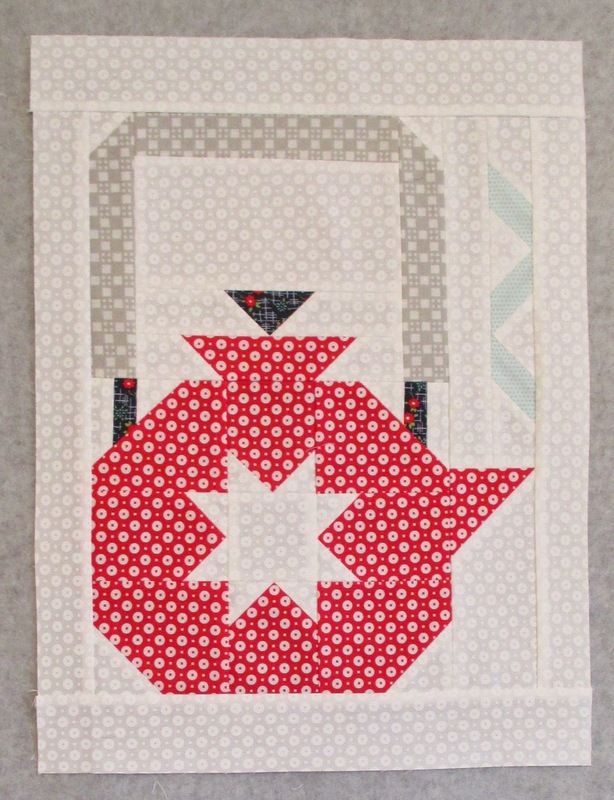 This month's pattern, Block Three, is Put the Kettle On, my latest favorite. I made my block exactly like the pattern, no changes this month, but I am eager to see what you use to make this block. I was blown away by the very clever and interesting sewing machine blocks that were pieced last month. Since I actually have a red polka dot tea pot in my kitchen I couldn't imagine any other option. The pattern was very easy to follow, it only took me a couple of hours to cut and piece this block. Three blocks done, 9 more to go. Here are a few more folks participating in the sew along, be sure to check out how they decorated their tea pots.